It's hard to believe there was a time when garlic wasn't a staple in the kitchen. Today there are over 600 cultivated sub-varieties of garlic throughout the world. How many have you tried? All garlic belongs to the genus Allium and the species sativum. The species is further divided into softnecks var. sativum and hardneck var. ophioscorodon. Garlic originated in central Asia, where they have cold winters and damp springs. Today's hardneck varieties still prefer these conditions and are favored by northern growers. Luckily softneck varieties developed from the hardnecks and are able to be grown in warmer climates. Hardneck garlic gets its name from the stiff stalks, or neck, of the garlic plants. Hardneck garlic tends to have fewer cloves than softneck varieties, with the cloves circled around a central stalk and rather uniform in size. Rocambole: Rocambole is the most often encountered hardneck type and the term 'rocambole is sometimes used synonymously with hardneck. Rocamboles have parchment skins that are quite a bit thinner than softneck varieties. These thin skined bulbs don't store long, but they peel easily. Rocombole garlic is the type you'll see with the distinctive curling, topset scapes that give them the nickname "serpent" garlic. These topsets are called bulbils. Garlic can be propagated from bulbils, but you’ll need to wait two years for the plants to develop. Popular 'Spanish Roja' is a rocambole. Purple Striped Garlic: Purple Striped Garlic is just that. All purple striped garlic varieties exhibit some stripping, but that's where the similarity ends. Some are very mild tasting and some are extremely pungent. They even mature over a range of times. Two nice varieties to try are 'Starbright', with a kind of nutty flavor and 'Chesnok', which holds up well when roasting. Porcelain Garlic: Porcelain garlic makes a plump bulb with only a few fat cloves. Porcelains are covered in a very thick outer skin, making them a good choice for storing. 'Georgian Crystal' is at the mild end in flavor while 'Romanian Red' has a hot, lingering tanginess. Softneck garlic, as mentioned, is well adapted to warmer climates. It is softneck garlic that you are likely to find in the grocery store because softneck garlic stores and travels better than hardneck. Artichoke: Artichoke garlic is the most commonly grown commercial garlic. It has a couple of concentric rows of cloves and tends to be very difficult to peel. But it produces and stores well and this is what you probably buy at the grocers. 'Red Toch' is a well-known Artichoke variety. Silverskins: Silverskins have silvery, white skins and are composed of many small cloves. They also have a nice sturdy neck that is easily braided. The flavor of Silverskins is usually stronger than Artichokes. 'Nootka Rose' and 'Rose du var' are both full-bodied Silverskins. So-called 'Elephant Garlic' has become popular recently. Its called elephant because of its relatively large size. Very mild flavor, it's great for diners who haven't quite warmed to the taste of garlic. In fact, elephant garlic is not a garlic at all, but a type of bulb-forming leek. Garlic is one of the easiest plants to grow. You plant the individual cloves within the bulb. Plant the largest cloves you have, to get the largest bulbs. Plant each garlic clove two to three inches below the soil surface and about 6 inches apart. A common novice dilemma is not knowing which end is up. It’s the pointed end. Your garlic will still grow, planted pointed side down, but the shoot will have to curve around you will wind up with a malformed bulb. Whether to leave the topsets on or cut them off, is a matter of controversy. Most experts believe the scapes drain energy that would otherwise go into bulb development, resulting in a smaller yield. Cutting them off as soon as the stalks begin to curl would redirect the energy downward. Other garlic growers feel allowing the scapes to remain until they turn woody results in a better storing bulb. A compromise is to cut the topsets while they are young and use them in cooking. Fall is garlic planting time. Depending where you are gardening, this could be September to November. Once the soil temperature has cooled off to about 60 degrees F. , the roots of the garlic clove will start to germinate and begin to take hold and anchor the plant. This is especially important in Northern climates where the ground freezes. 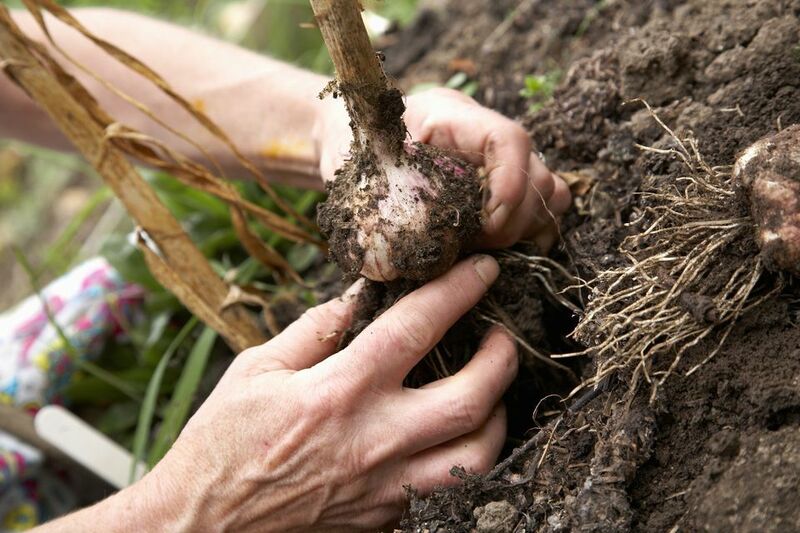 Without sufficient time to grow good roots, the garlic plants will heave out of the ground. A three to four inch layer of mulch applied after the ground freezes will also help prevent heaving. Straw is the mulch of choice because it’s cheap and easy to remove. Garlic is relatively pest free, if you use good seed cloves. It is, however, popular with some rodents, especially gophers. Dig, don't pull garlic out of the ground. You may have planted a small clove, but the bulb is now several inches deep with a strong root system. When to harvest garlic is a judgment call, but basically it’s ready to go when the lower leaves start to brown. About the only way to be sure is to actually dig a few bulbs and slice them in half. If the cloves fill out the skins, it’s time. Harvesting too soon will result in smaller cloves that don’t store well. Leave the bulbs in the ground too long and the cloves may be bursting out of their skins, making them unstorable and open to disease. Brush off any soil clinging to the bulbs. Allow the bulbs to cure or dry for three to four weeks in either a well-ventilated room or a dry, shady spot outside. Once the tops and roots have dried they can be cut off. You can also further clean the bulbs by removing the outer skins. Just be careful not to expose any of the cloves. Garlic likes to be on the cool side, 32oF - 40oF. The softneck varieties may last 6 - 8 months. Hardnecks should be used soon after harvesting. Hardneck varieties may dry out, sprouting or go soft within 2-4 months. Keeping hardnecks at 32oF sometimes helps them survive for up to 7 months without deteriorating. If you're a beginning seed saver, there is nothing easier than saving garlic. Simply put aside a few top quality bulbs to plant next season. Store bulbs for replanting at room temperature, with a fairly high humidity of about 70%.